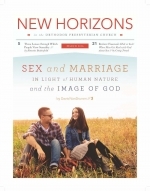 There seem to be three lenses through which to examine today’s sexual landscape. The first views gender and sexuality as cultural artifices, not ontological, God-ordained categories. Folks with this lens reject the idea that the Bible is an inerrant (without error) and inspired-by-God text, even though some claim a deep love for many parts of the Bible, and a self-identified high view of Scripture. It is not unusual to have a high but also flawed view of something. People can have a high view of something that they don’t understand. I may have a view of Shakespeare’s sonnets, but if I cannot scan for iambic pentameter, I will only be able to appreciate them in a surface or “vulgar” way. Faithful readers of any text may have differing levels of literacy in discerning the meaning of those texts. For much of our history, American Christians have enjoyed the luxury of theorizing at leisure about their relationship with institutions of common culture. The pace of current events, driven by societal attitudes regarding marriage, family, and sexuality, means that what was once an abstract debate has increasingly tangible implications. Many Christians and churches will face decisions that would have been inconceivable just a generation ago. Thinking together about how to live wisely in the world has taken on fresh urgency today.